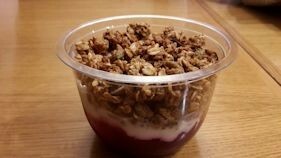 Here I discovered gluten free granola topped with yogurt – delicious! Ray decided on his usual – cucumber and tuna baguette (which crucially has no butter) and picked out the slices of cucumber, which he can’t eat. The cups of tea with soya milk revived us. As we had been told (and researched ourselves) that alcohol was expensive in Sweden, we bought a few bottles of wine in the duty free. The idea was that we could have drinks in the room with our friends (who were travelling from Liverpool) and then not order wine with our meal (although Ray doesn’t drink alcohol and I drink very little). At Stockholm Airport, we asked the information desk where we could catch the train to the city and then took the lift to the station on the floor below. The Arlanda Express www.arlandaexpress.se takes only 20 minutes to the city and gives you a great opportunity to see the Swedish countryside. It was Friday so we got a good deal – two tickets for 300 Swedish kroner (SEK)/£27. 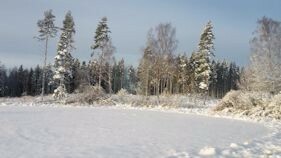 We should have asked for a return because on the way back on Monday we paid 560 SEK/£50. You have been warned. From the railway station, it was a short walk to our hotel, although we had to ask a couple of people where it was as the map wasn’t clear. We were tired from our early morning start and the walk from the railway station, so decided to have lunch at the hotel. 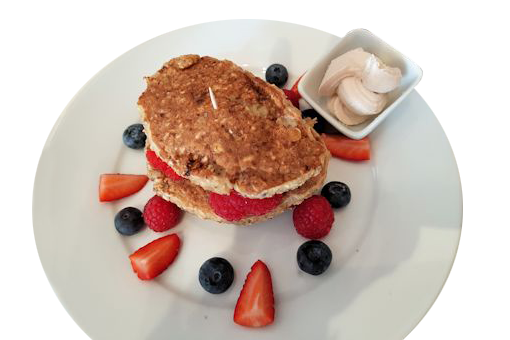 A member of staff was helpful in telling us whether dishes contained gluten or dairy. We concluded there was nothing we could eat on the a la carte menu, but there was plenty we could eat from the cold salad buffet. 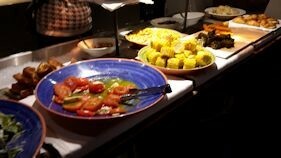 Buffets are excellent because usually you can see at a glance whether you can eat a certain dish. 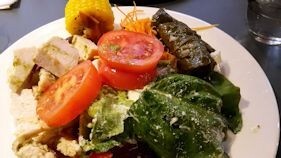 Our meal consisted of cold chicken, dolmades, grated carrot, tomatoes, lettuce and corn on the cob (which were not coated in butter) – 120 SEK/£10.90 each. We didn’t think our friends would like a hamburger joint, so we tried several more restaurants. Trying to book a table for eight so near Christmas was difficult. 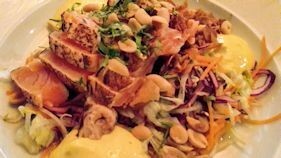 We continued walking around until we found, by chance, Jamie’s Italian, Humlegårdsgatan 23, https://www.jamieoliver.com/italian/sweden/restaurants/stureplan/ where we were able to book a table. Our first choice would have been a more traditional Swedish restaurant, but we were getting desperate by this time. 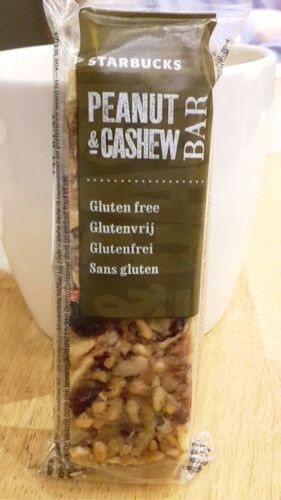 We stopped off for a tea with soya milk at Starbucks (as we thought there would be soya milk) in Stureplan http://www.starbucks.se/stockholm-stureplan.php where I enjoyed a gluten free peanut and cashew bar. 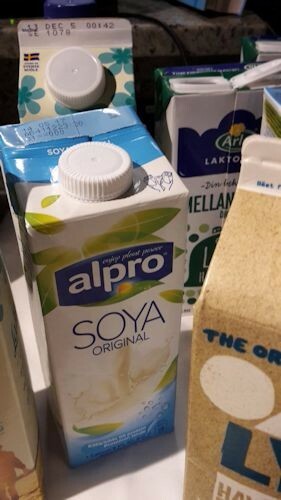 As there were tea-making facilities in our hotel room, we bought our own packet of Alpro soya milk from Hemköp supermarket on Ostermalm https://www.hemkop.se/ but couldn’t see a ‘free from’ section. Fortunately we had brought Nairns oatcakes www.nairns-oatcakes.com/gluten-free and nak’d bars /www.naturalbalancefoods.co.uk/nakd-fruit-and-nut-bars/ with us as a stopgap – we always travel with these items – just in case. 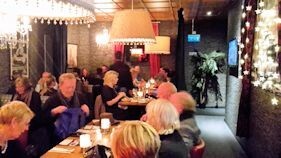 That evening, our friends seemed to be happy with our choice of restaurant. 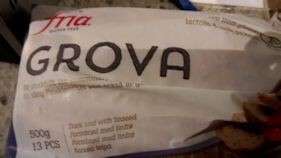 On the menu there were gluten free options clearly marked – pasta and pizza. I opted for Gennaro’s Tagliatelle Bolognese (175 SEK with no pangrattato (breadcrumbs) and Parmesan. I enjoyed it, although I found the sauce thin and watery. Ray explained he had an allergy to dairy and asked if he could have Jamie’s Italian Burger with no cheese or sliced tomato. I queried the brioche bun as traditionally it has butter in it. Our waiter checked with the kitchen and was told it had no dairy in it. The burger was placed in front of Ray with great aplomb. Automatically Ray removed the ‘lid’ of the bun to check the dish. To his surprise, there was a yellow sticky ingredient on top of the burger which I tasted. It was cheese, so we sent it back. The waiter was apologetic, but if Ray hadn’t removed the top of the bun, he wouldn’t have known there was cheese in the burger and would have been poorly. 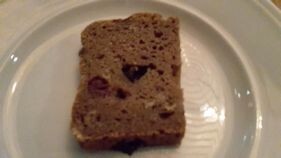 At breakfast at the hotel, there was a vast buffet – cold meats, salad, bread, avocadoes, fruit, jams, while the hot buffet offered meat balls (which I was informed contained gluten), bacon and scrambled eggs. 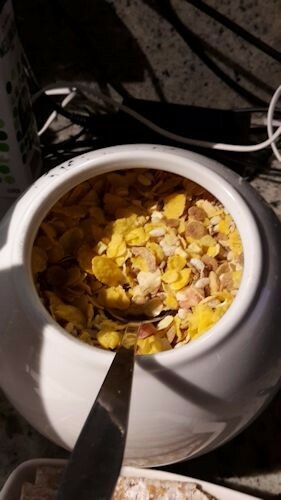 I found a tiny ‘free from’ area where there was a collection of ‘free from’ milks including almond and soya; lactose free yogurt and gluten free muesli, which I recognised as Schar’s. Ray asked a member of staff to check the packaging to see if the smoked ham had dairy in it. It didn’t. 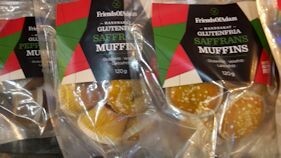 After asking for gluten free bread, they found some which I then toasted. There wasn’t a designated toaster for gluten free bread, so you might have to go without toasting it, depending on how sensitive you are. The toast was delicious with strawberry jam. The next day we watched the colourful changing of the guard ceremony at 12.15pm in front of the 250 year old Royal Palace. The weather had changed; it was now snowing so I had taken the precaution of wearing my special snow boots. 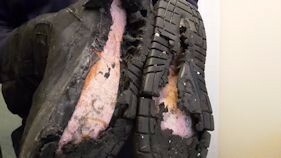 While we were walking round the Gamla stan, the ‘Old Town’ with its narrow cobbled streets and golden buildings, I became aware that one of my boots were disintegrating and sure enough, a great lump of sole lay in the snow. Fortunately I was able to keep walking although it wasn’t very comfortable and soon the other boot was, too, falling away. 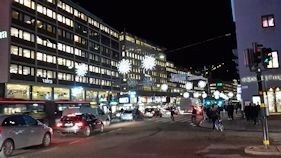 Eventually we managed to flag down a taxi for the hotel which wasn’t as expensive as we thought, 120SEK/£10.90. It was a relief to sit in the taxi not only because of my boots, but also the weather was getting worse. 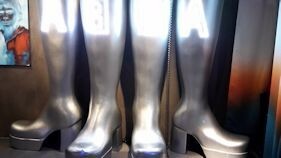 Reunited with my ordinary boots, some friends joined us and suggested we should try a Thai restaurant round the corner from the hotel as the weather was so bad. 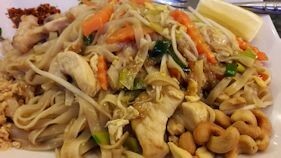 From experience, we know Thai food doesn’t contain dairy. Thai Take Away Samniang www.thaitakeaway.kvartersmenyn.se was the Thai equivalent to a “greasy spoon café” with very little seating. We didn’t realise it was predominantly a takeaway joint, but a staff member welcomed us and joined two tables together. We both chose dishes we’d eaten before. 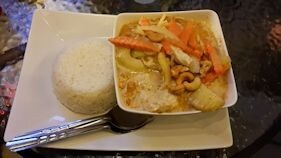 Mine was Chicken Thai Pad, while Ray had chicken Massaman curry with rice. 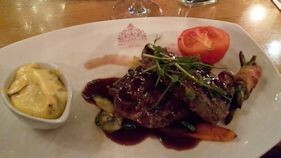 Each dish was around 89 SEK/£8 – very reasonable and just what we needed to keep warm. It tasted delicious too. Our friend Neil had found a restaurant for the evening – Drottninghof Grill & Bar www.drottninghof.se I found the service excellent and the staff were very helpful regarding our food allergies, although it has to be said that vegetarians might find it a struggle as the menu is predominantly meat. 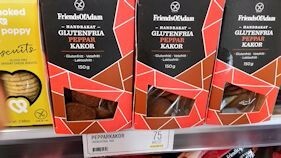 The house speciality is home-made meatballs made of deer and elk with loganberries. 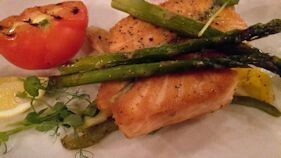 My choice was grilled salmon with asparagus and potatoes. 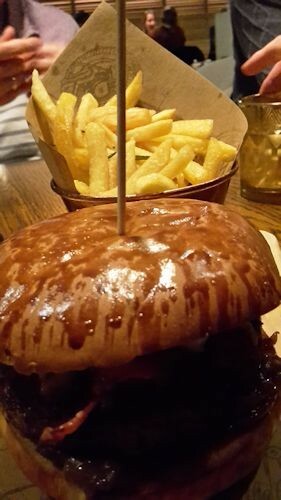 Ray explained his allergies and said he wanted “Oxfile” – this is filet of beef on a wooden slate, traditionally served on mashed potato, but the staff member said that instead of this, it would be served on a plate with French fries. He was very quick to understand what Ray could eat - as our friend Alan remarked “That’s the quickest Ray has ever placed his order.” The food didn’t disappoint either – it was very tasty. 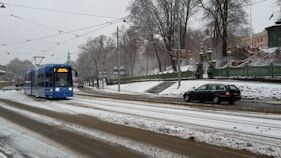 The next day we caught a taxi to The Abba Museum www.abbamuseum on the island of Djurgården, as the snow was getting worse. 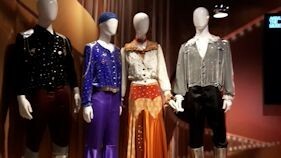 This museum is a must for Abba fans. Even if you’re not a fan, there’s still something to see and do for everyone. 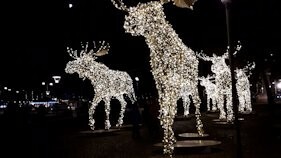 It’s worth booking online in advance – entrance is 195 SEK/£18 per person. 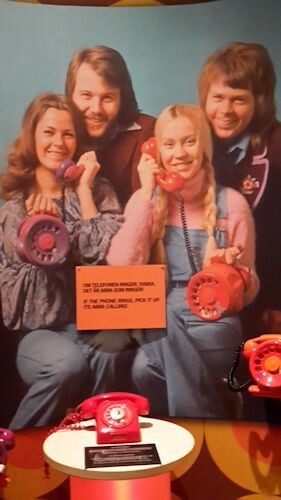 Included in the ticket is an audio commentary which is accessed by swiping a plastic phone-like contraption across a reader at strategic points of the exhibition. This means you can hear the members of the band sharing their early memories – how they met, how they began their careers and so on. There are plenty of videos to watch and opportunities to join in – you can stand on stage and sing alongside holograms of the band. Awesome! 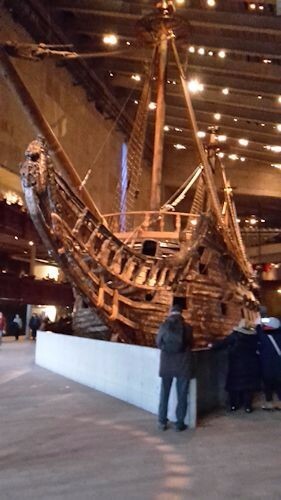 After this, we trudged through the snow to the next museum - Vasamuseet (Vasa Museum). 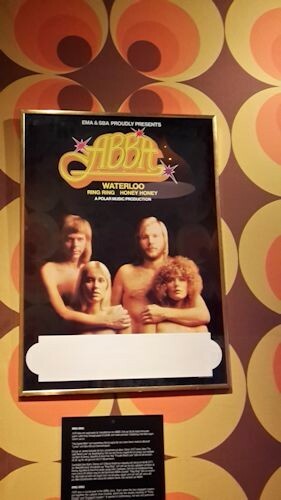 Although it is only a short distance from the Abba museum, it seemed much further in the show. Entrance is 130 SEK/£12 per person. 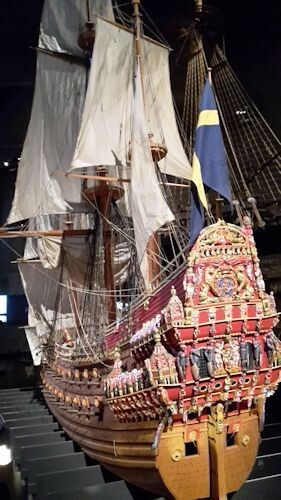 The museum displays the only almost fully intact 16th century ship that has ever been salvaged, the 64-gun warship Vasa that sank on her maiden voyage in 1628. 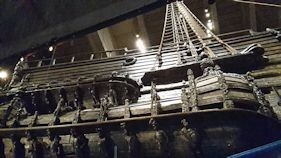 It truly is a spectacular sight and you can view different parts of the ship on each floor. There are additional displays of artefacts recovered during the salvage operation. The many lion sculptures reflect that King Gustav II Adolf, who commissioned the vessel, was known as the Lion of the North. An astonishing and absorbing visit. 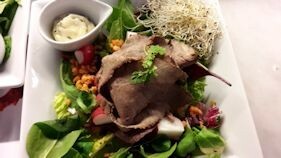 For lunch, Ray and I ordered a roast beef salad. 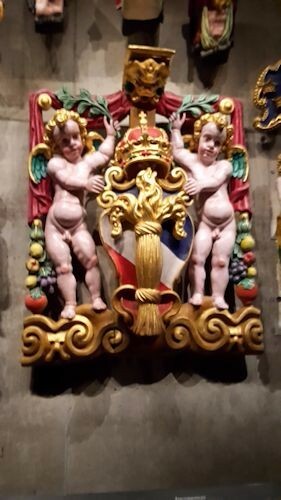 The menu at the Vasa Museum has symbols on the menu (G means contains gluten, L contains lactose, E – egg) which is helpful, but revealed there wasn’t much choice. On our last night, we dined at Urban Deli www.urbandeli.org, a short walk from the hotel. This isn’t just a deli, as the name suggests, but also a restaurant. 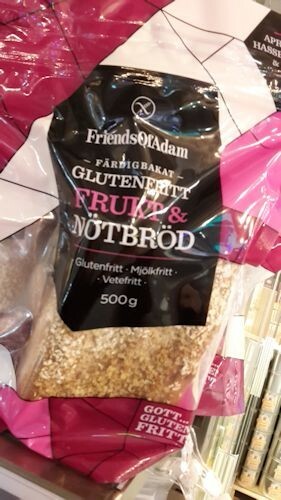 It sells many ‘free from’ foods such as Friends of Adam http://www.friendsofadam.se/ fruit and nut gluten free bread, gluten free and dairy free biscuits and gluten free muffins. Not many dairy free products to be seen. 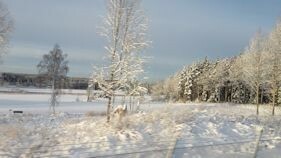 On the next day, as we took the train back to Arlanda Airport, we were able to admire fabulous snowy ‘postcard’ views of the countryside while basking in the warmth of the train.